Before you take your dog to any body of water, check the local and state swimming advisories to see if there are any blue-green algae warnings. It should be the epitome of pure joy: a dog leaping off the dock and splashing into a lake on a sweltering summer day. But for some dog owners, the scene can quickly turn into tragedy. The culprit: toxic blue-green algae. 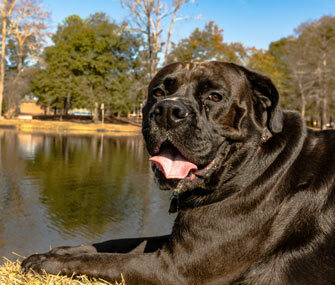 Although dogs are most commonly affected, blue-green algae can be toxic — and even fatal — to cats, horses, livestock, birds and other wildlife that drink from contaminated ponds or groom themselves after being in the water. For people who water ski or swim in water containing toxic blue-green algae, or who inadvertently swallow the organisms, exposure can also lead to illness and death. Despite their name, blue-green algae aren’t really plants. Although they live in the water and make their own food through photosynthesis, they’re actually microscopic organisms called cyanobacteria that can be found in freshwater lakes and streams, brackish water (a combination of fresh and salt water), marine water and even backyard ponds. That’s when clear water can be transformed into a witch’s brew that resembles pea soup or green paint. The algae may float underneath the water, collect on the surface in an oily film or form a thick scum that can hinder swimmers and boats. As the algae die, they can emit a stench like rotting plants. Because dogs tend to love all things putrid and stinky, they’re more likely than people to dive into the turbid waters. They can inadvertently swallow blue-green algae, especially when fetching balls, decoys and, in the case of hunting dogs, wild game. And it doesn’t take much to cause a problem — just a few mouthfuls can be harmful. Blue-green algae can produce a number of different toxins, including microcystins and anatoxins. The signs in a dog can vary depending on the type and amount of toxin ingested. Microcystins can cause liver damage, which can lead to weakness, vomiting, diarrhea, a yellowish tint to the skin, bloody or black stools, pale or yellow gums, seizures, and coma. Anatoxins, on the other hand, tend to affect the central nervous system. Signs may include excessive drooling or tearing, muscle tremors, paralysis and difficulty breathing, resulting in a bluish tone to the skin and gums. According to the CDC, humans can be exposed to cyanobacteria toxins by skin contact, ingestion or inhaling droplets containing the cyanobacteria that have been dispersed into the air. Skin contact with the toxin may result in rashes and inflammation. Inhalation can cause difficulty breathing. Ingestion can lead to cramps, vomiting, diarrhea and neurological signs, such as tingling and numbness, as well as death. Unfortunately, diagnostic tests for blue-green algae aren’t widely available in veterinary medicine. And there’s no medication that can reverse the toxin once the dog begins to show signs. Because toxic effects can happen quickly, if you suspect your dog has been exposed to blue-green algae, it’s important to seek veterinary help immediately. When in doubt, contact your veterinarian, emergency veterinarian or the ASPCA Animal Poison Control Center for life-saving advice! If the dog isn’t showing signs yet, the veterinarian may induce vomiting. Otherwise, the dog may require hospitalization and treatment can include intravenous fluids, medications to help control seizures, anti-vomiting medications, plasma transfusions, oxygen therapy or even mechanical ventilation to help him breathe. Before you take your dog to any body of water, check the local and state swimming advisories to see if there are any blue-green algae warnings. And if the water looks suspicious, it’s better for your dog and your family to stay out. After all, it’s not easy to determine if algae are poisonous by their visible appearance. “Not even a trained veterinary toxicologist or expert can tell if algae are poisonous by just looking at them — special tests and microscopic evaluation have to be done,” according to Dr. Lee. “As a result, the safest thing to do is to keep your dog away from any pond with algae on the surface.” That advice goes for you, too.